US software maker Symantec is the latest tech company to announce that it will split its operations into two. The Norton antivirus software maker said it would spin off operations into two publicly traded firms, one focused on security and the other on storage. The move follows similar operational division by tech giants Hewlett-Packard (HP) and eBay. 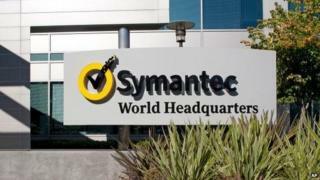 Analysts said the break-up by struggling Symantec would make it more attractive for takeovers. Potential buyers like Cisco and NetApp are likely to show interest in Symantec's California-based businesses, said Piper Jaffray analyst Andrew Nowinski. Its earnings growth and share price, impacted by slow PC sales, has lagged behind other software makers and led Symantec to fire two chief executives since 2012. The company's revenue fell 3% to $6.7bn (£4.1bn) in its recent fiscal year on a struggling storage business, while operating income fell almost 20%.